The generic SortedList SortedList<TKey, TValue> represents a collection of key-value pairs that are sorted by key based on associated IComparer<T>. A SortedList collection stores key and value pairs in ascending order of key by default. C# includes two type of SortedList, generic SortedList and non-generic SortedList. Generic SortedList denotes with angel bracket: SortedList<TKey,TValue> where TKey is for type of key and TValue is for type of value. Non-generic type do not specify the type of key and values. The following diagram illustrates the generic SortedList hierarchy. 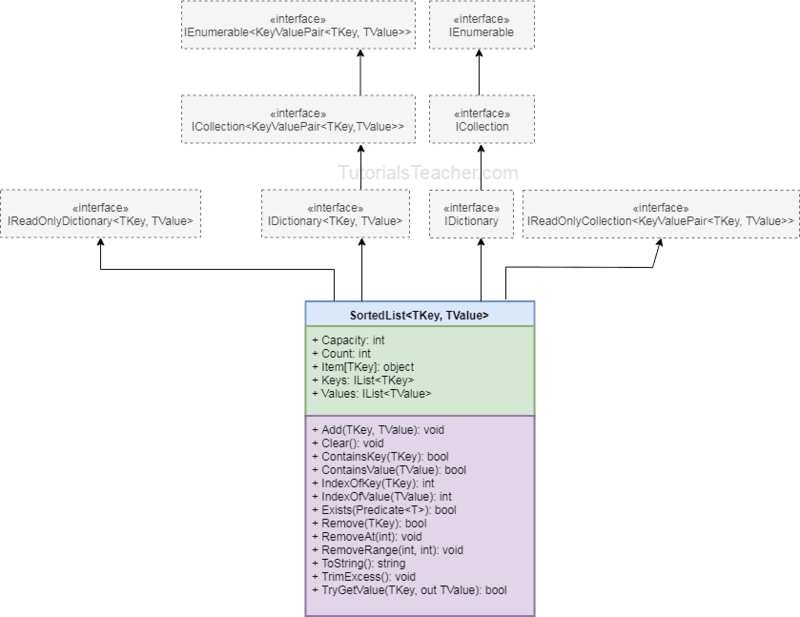 Internally, SortedList maintains a two object array, one for keys and another for values. So when you add key-value pair, it does binary search using key to find an appropriate index to store a key and value in respective arrays. It also re-arranges the elements when you remove the elements from it. You can instantiate SortedList<TKey, TValue> by specifying type for key and value, as shown below. In the above example, mySortedList will store the keys of int type and the values of string type. Add Add key-value pairs into SortedList<TKey, TValue>. Remove Removes element with the specified key. RemoveAt Removes element at the specified index. ContainsKey Checks whether the specified key exists in SortedList<TKey, TValue>. ContainsValue Checks whether the specified key exists in SortedList<TKey, TValue>. Clear Removes all the elements from SortedList<TKey, TValue>. IndexOfKey Returns an index of specified key stored in internal array of SortedList<TKey, TValue>. TryGetValue Returns true and assigns the value with specified key, if key does not exists then return false. Use the Add() method to add key value pairs into a SortedList. The key cannot be null, but the value can be null. Also, the datatype of key and value must be same as specified, otherwise it will give compile time error. The following example shows how to add key-value pair in the generic SortedList collection. SortedList collection sorts the elements everytime you add the elements. So if you debug the above example, you will keys in ascending order even if they are added randomly. The following image shows SortedList in debug view. As you can see in the above image, sortedList1 stores key-value pairs in ascending order of key and sortedList2 stores items in alphabetical order of key even if they are not added in that ordered. sortedList3 includes nullable int so that it includes null as a value. Key/value pairs can also be added using object-initializer syntax, as shown below. The SortedList can be accessed by the index or key. Unlike other collection types, Indexer of SortedList requires key and returns value for that key. However, please make sure that key exists in the SortedList, otherwise it will throw KeyNotFoundException. The foreach statement in C# can be used to access the SortedList collection. SortedList element includes both key and value pair. so, the type of element would be KeyValuePair structure rather than type of key or value. If you are not sure that particular key exists or not than use TryGetValue method to retrieve the value of specified key. If key doesn't exists than it will return false instead of throwing exception. Use the Remove(key) and RemoveAt(index) methods to remove values from a SortedList. The ContainsKey() checks whether the specified key exists in the SortedList or not. You can use LINQ query syntax or method syntax to access SortedList collection using different criterias. Sort the SortedList in descending order. Properties and methods of SortedList<TKey,TValue>. C# has a generic and non-generic SortedList. SortedList stores the key-value pairs in ascending order of the key. The key must be unique and cannot be null whereas value can be null or duplicate. Generic SortedList stores keys and values of specified data types. So no need for casting. Key-value pair can be cast to a KeyValuePair<TKey,TValue>. An individual value can be accessed using an indexer. SortedList indexer accepts key to return value associated with it.